A PHILANTHROPIST and former foreign minister of Somaliland had lunch in Henley as part of a friendship arrangement. 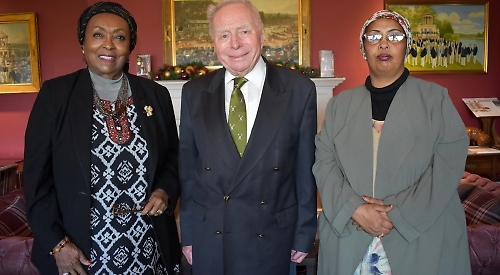 Dr Edna Adan Ismail, a British-trained nurse and midwife who founded a hospital in the republic’s capital Hargeisa, was greeted at Leander Club by members of the Henley Borama Friendship Association. She was in Britain to collect an honorary doctorate from London South Bank University and was accompanied by Rhoda Ibrahim, the director of the Somali Advice and Forum of Information. Dr Ismail spoke about the hospital, which opened as a maternity unit in 2000 with only 26 trainee midwives but now delivers thousands of infants every year.